Everybody wants to succeed in whatever they are doing. Some are ready to perhaps take one step too far. Would you? Where is the line between your desires and moral grounds? Can ambition push you over the edge and leave you hanging there feeling regret, sorrow, anger and disappointment? We can ask these questions infinitely, but there is never going to be one right answer. Or maybe any answer at all. ‘Break’ by Hot for Theatre was recommended to me by a lovely couple, who came over to visit Dublin during the Dublin Fringe Festival. They said they had been deeply impressed. Now I understand why. The story line is in a way a simple one. A usual day at underprivileged school, the teacher’s room is buzzing. A newly promoted vice principle and 4 teachers are trying to get through another day by shouting at their students, as, in their opinion, it is the only way to teach them discipline. It’s a part of the routine for them. Except that they can’t get rid of the elephant in the room. It’s a memory of a student, who had recently committed suicide, followed by a mass, that turned out to be a complete disaster. Everyone is trying to cope with what could be described as a very emotional situation, topped with a pile of private problems. They are failing, up until the arrival of a new teacher, named Kelly. A unique character, she teaches the troubled kids how to rap and how to express themselves in a non violent way. However her methods are doubted by other teachers, primarily because they are feeling threatened all of the sudden, as if their authority is being questioned. Up until they are forced to get out of their comfort zone and try this new method themselves. They are asked to express themselves, express their concerns, emotions, describe their job and all struggles using rhymes. First skeptical, they give it a shot and oh, surprise – they like it! The memory of why they have chosen to be teachers comes back in an instant. It’s like watching people magically heal. They had forgotten that teaching can be fun. Apart from one of the teachers, who is too deep in an infinite swamp of personal issues with ambiguity and envy being heavy stones that are doing nothing, but helping to sink. She tries to hide her selfishness and greed behind good deeds and intentions, but she can’t fool even herself. Each and every one has played their role fantastically well. Stage set up was simple, yet not boring and ever changing, even though the same pieces of decor were used to change the setting so it could be viewed from different angles. Lighting deserves a special credit, it was very well thought through, drawing audience’s attention exactly to were needed and when needed. A pleasant surprise was the use of the piano, a sound of a live instrument always creates a charming atmosphere. I thought it was a nice touch. Finally, having musical scenes just made performance even more enjoyable. It’s quite rare to meet a person these days, who would say – I love my job. It’s the unfortunate truth. Have you ever thought why? Is it because we carelessly chose our profession before making up our minds on the dream job? Or is it because we let go of our dreams as we grow up? Do we let them sink in a daily routine and the sea of problems that come in the same package with an adult’s life? We tend to put these sacred thoughts in the far corner of our minds and hearts, for better days. What is the point then? If you chose to make the world a better place, do you contemplate the weight of the consequences that follows carelessness? If you chose to make difference by influencing other people’s lives, to help young souls to develop themselves, can you afford to be selfish and essentially ruin the experience for them? If your dream becomes a burden, how wise is the choice you made? These are the kind of upsetting questions that we prefer not to think about and put it behind a locked door deep in our soul and loose the key, hoping someone is going to find it and unlock that door again. ‘Break’ has an amazing ability to remind you of it all while also making you laugh. The amount of humor in the play comes at the right weight to match the tragic part of it. Comedy and drama – the more extreme both are, the more successful is the marriage between them. It’s exactly what I thought about ‘Break’. 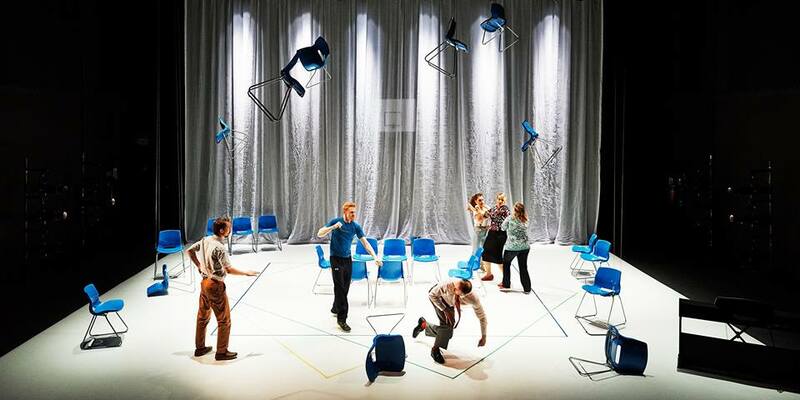 Verdict: Exquisite piece of theatre with deep philosophical idea in the core.